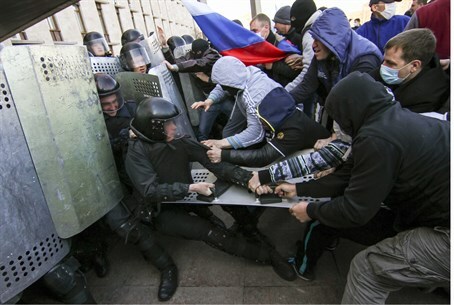 After armed men storm government buildings, encourage uprising in Donetsk, Ukraine fights back; clashes kill one, injure 5. A Ukrainian security officer was killed and five more were injured Sunday in clashes that broke out between government forces and pro-Russian separatists in Donetsk. Acting Ukrainian Interior Minister Arsen Avakov stated that there were "casualties on both sides" from the clashes, including many more injured from the separatist side. According to Avakov, about 1,000 people were gathered in support of the pro-Russian demonstrators. The minister announced earlier Sunday that an "anti-terrorism" operation had been launched against the separatists, who had stormed government buildings in the turbulent province. "Units from all law enforcement agencies of the country are being used [in the operation]," Avakov wrote, in a Facebook post. "God is with us!" He added later, "Tell all civilians to leave the center of town - don't leave your apartment, or go to the window." Details of the alleged operation remain unconfirmed. Several cars with loudspeakers were circling the center of Sloviansk Sunday, broadcasting a call for the residents to join the armed separatists, local daily Novosti Donbassa reported. Protestors have demanded, once again, a referendum to secede from Ukraine. "We want to create a people's republic, a real one, one in Donetsk, one in Luhansk, and in general, let the people of the southeast determine what they want. We want to hold a referendum," a pro-Russian activist in Sloviansk told Reuters Sunday. On Saturday, armed men in masks stormed and seized administrative buildings and police stations in Sloviansk and at least two other towns in Donetsk. In Sloviansk, they captured scores of weapons in the police station and distributed them to local separatists, UNIAN news agency reported. Russian flags have been hoisted over the seized buildings; Ukrainian authorities have blamed Russia for instigating the takeover. Ukraine's Acting President Alexander Turchinov held an emergency meeting of his security and defense council on Saturday evening to address the ongoing situation. So far, Ukrainian military vehicles were seen circling protest sites early Sunday morning; local media also reported automatic gunfire and explosions heard near the center of town. Meanwhile, the US continues to back Ukraine in the ongoing conflict between Moscow and Kiev, with US Secretary of State John Kerry warning Russian Foreign Minister Sergei Lavrov Saturday night that it would enact "additional consequences" against Russia if the revolts in eastern Ukraine continue. Donetsk has been the seat of pro-Russian tensions since earlier this month, when neighboring Crimea held a controversial referendum vote and was annexed by Moscow after a de facto military invasion of the region. The annexation led to a bold call from Ukraine's now-deposed President, Viktor Yanukovych, to hold referendums nationwide - and let other provinces decide their national allegiances to either Russia or Ukraine. Analysts suspect the move may have escalated tensions in eastern Ukraine and could have contributed to the current crisis there.